Brush a 12- by 9-inch baking dish with oil. Line it with plastic wrap and brush the wrap with more oil. Put the sugar, corn syrup, salt, and ¾ cup water in a heavy medium saucepan. Bring to a boil over high heat, stirring to dissolve the sugar. Once the mixture comes to a boil, continue to cook without stirring until the mixture registers between 238 and 245 degrees on a candy thermometer, about 10 minuteWhile the sugar mixture is cooking, dissolve the gelatin in the remaining ¾ cup water in the bowl of an electric mixer fitted with a whisk attachment. Let stand for at least 5 minutes. When the sugar mixture comes to the correct temperature, turn the mixer on low speed and very carefully pour it into the gelatin mixture. Increase the speed to high and beat for 15 minutes or until very thick and stiff. Add the vanilla and maraschino cherry liquid and mix well. Add the chopped cherries and mix in. Pour the mixture into the prepared dish and smooth the top with a large spatula. Let stand, uncovered, at room temperature overnight. The next day, sift about a cup of powdered sugar onto a work surface, unmold the marshmallows on top of the powdered sugar, and peel off the plastic wrap. Sift more powdered sugar on top. Brush a long, thin, sharp knife with oil and cut the mixture into 1 inch squares. Sift more powdered sugar over the marshmallows and roll each one to coat until no longer sticky. Place the chocolate chips and shortening in a microwave-safe bowl and heat until most of the chips are melted, about 1 ½ minutes. Stir until smooth and glossy. Let the chocolate cool. 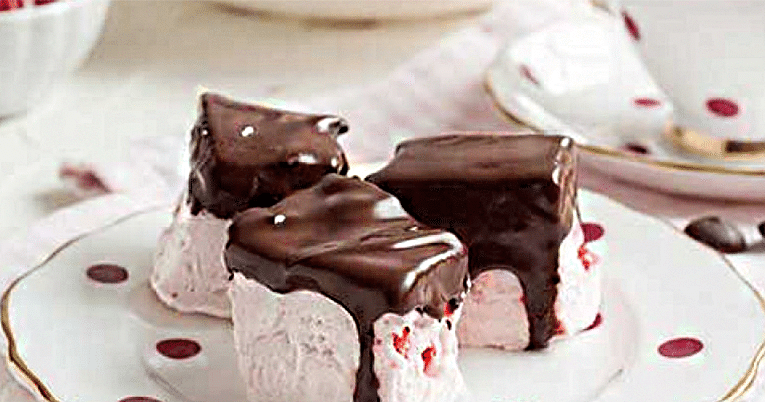 Dip the marshmallows into the chocolate. Turn the marshmallows chocolate side up and let the chocolate harden. Can be made ahead and stored in an airtight container or food storage bag in the refrigerator.